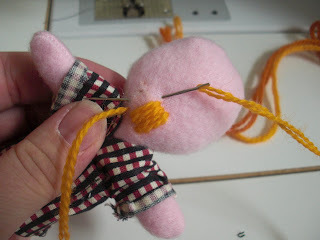 STEP ONE: Create his basic body by sewing around the person pattern on a piece of doubled fleece. (Basic instruction can be found in step one here.) 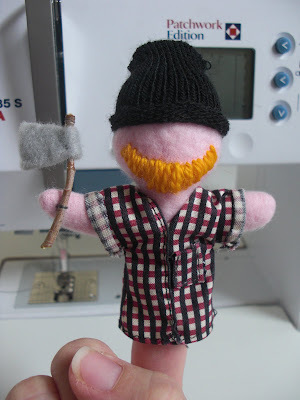 I made my woodsman's arms a little extra wider, and stuffed them, so he would look a little more manly. 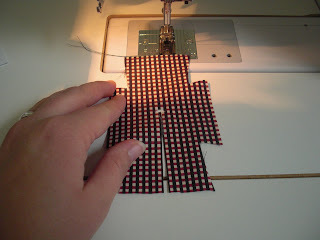 STEP TWO: Print shirt pattern (see end of post) and cut one from your plaid fabric scrap. STEP THREE: Turn one inner edge a scant 1/8" and topstitch. Continue stitching around the half-circle. Stop before reaching the opposite straight edge. 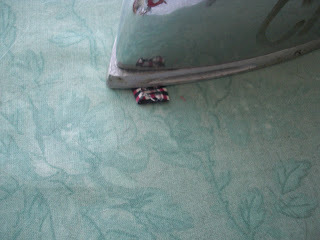 STEP FIVE: I really should have done this before sewing the side seams, but forgot. 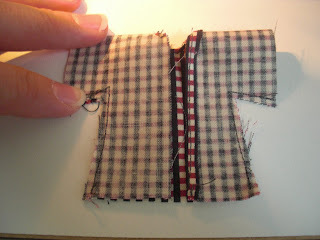 I cut a small square of plaid fabric and pressed all the edges under to create a pocket, then sewed it onto the front of his shirt. A little bit torturesome, but it's such a cute detail! 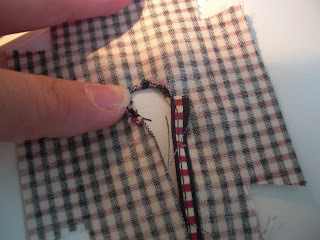 STEP SIX: Hand stitch the front of the shirt closed, with the finished side overlapping the unfinished side. 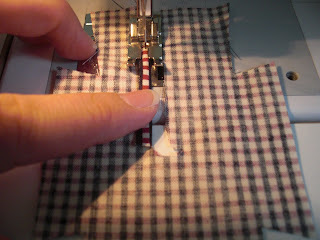 Roll the sleeves (if you decided not to hem them) and stitch in place. At this point he was looking a little, well, like a rap singer. 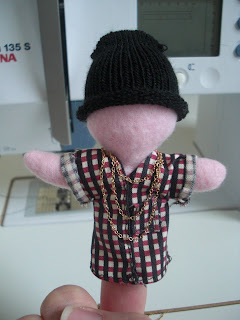 So I gave him a little temporary bling and had him sing a little Eminem before moving on. STEP SEVEN: Sew a yarn beard as shown. 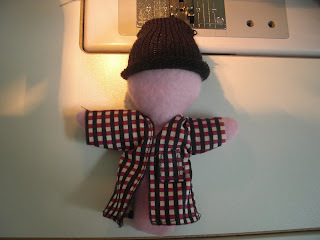 Handstitch his finger-glove hat to his head. I created his ax using a twig and a scrap of grey felt, then stitched it to his hand. I would shoot myself. Good job. I commend your patience! 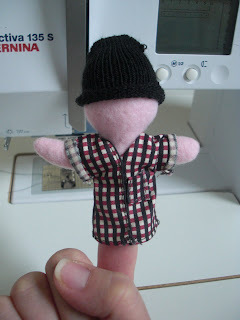 Thanks so much for the finger puppet tutorials you have been posting. I'm in the process of making my daughter a quiet book, so I'm really excited about your tutorials. I tried printing off the pig pattern on our Mac and our PC and it didn't work for me. I'm wondering if there is any possible way you could email me the pattern. If it's too much trouble, don't worry about it. Thanks so much! I love his beard & stocking cap, and I LOL'd at the Eminem. He's wonderful!! I love his little plaid shirt and his hat made from a glove. The Eminem reference cracked me up! Of course, I kept thinking of early 90's grunge scene. I suppose that dates me a little! He is SO CUTE! I can totally see him getting all the finger puppet ladies. Thanks so much, I'm loving this series! I'll be linking.